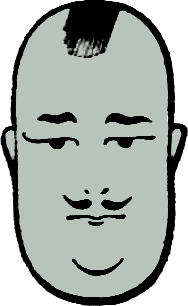 Whiteman’s famous “Potato Head” emblem. On this day, March the twenty-eighth, we remember the the “King of Jazz” himself, the eminent Paul Whiteman, on the 126th anniversary of his birth. To commemorate the occasion, I present one of his finest records, from the height of his fame, a time when his band contained the likes of Bix Beiderbecke, Bing Crosby, and so many other great figures of roaring twenties jazz. 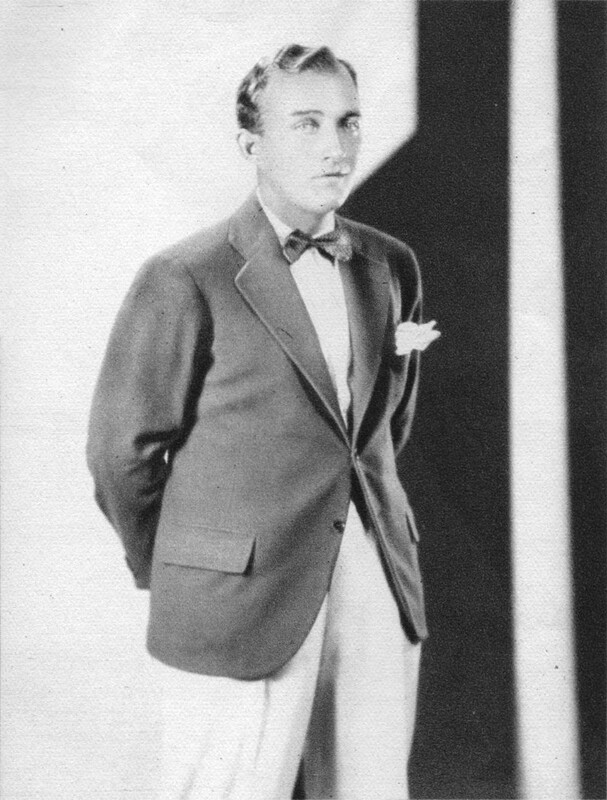 Paul Whiteman was born in Denver, Colorado to a musical family. His father, Wilberforce Whiteman, was a music instructor at the Denver County public schools, and at one point had as a pupil a young Andy Kirk, who later became the leader of the Twelve Clouds of Joy in Kansas City. As a youngster, Paul took up the viola, and played in several symphony orchestras, and led a band in the U.S. Navy during the Great War. After the war’s end, Whiteman started his own dance band, and began recording with Victor as “Paul Whiteman and his Ambassador Orchestra.” His first record, featuring “Whispering” paired with “The Japanese Sandman”, was a great success, and started him on the path to fame. 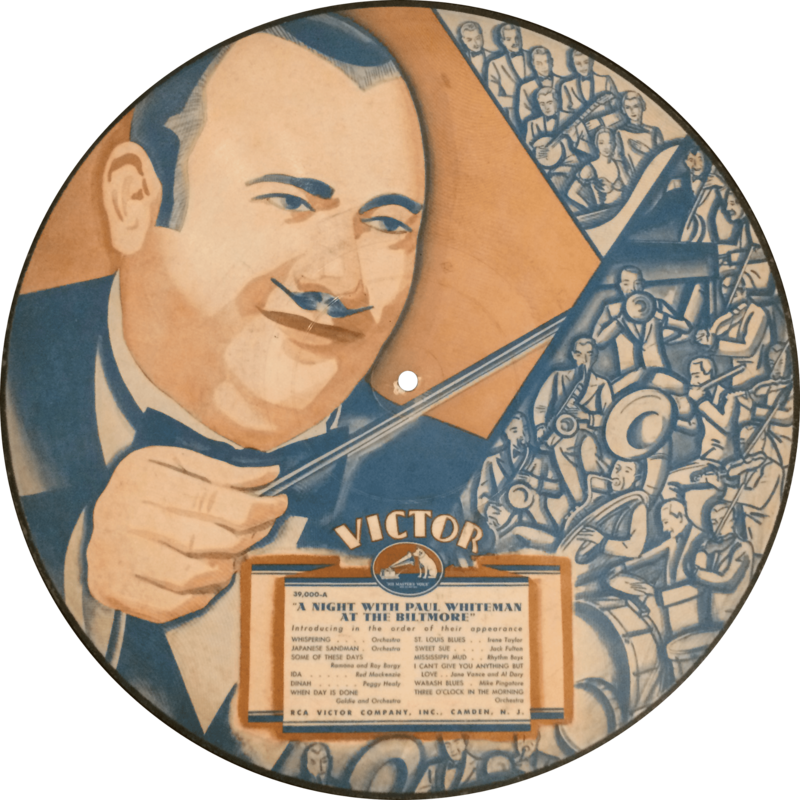 Over the next years, Paul Whiteman was a mainstay in the Victor catalog, and his records sold well, but he did not achieve his greatest fame until the last years of the decade. In 1924, Whiteman commissioned George Gershwin’s “Rhapsody in Blue”, which he premiered with his concert orchestra at An Experiment in Modern Music at Aeolian Hall in New York. In 1927, Whiteman was able to hire away some of the top musicians from Jean Goldkette’s band, including Frankie Trumbauer and Bix Beiderbecke, and he also picked up the Rhythm Boys: Al Rinker, Harry Barris, and Bing Crosby. By that time, he was making his name as the “King of Jazz” (the legitimacy of which is hotly debated), and was among the most famous names in music of the 1920s. In 1930, the Whiteman band starred in a grand technicolor motion picture vaudeville revue entitled King of Jazz. Into the Great Depression, Whiteman maintained his status for several years, introducing talent such as the charming Ramona (and her Grand Piano). Eventually, as swing became king, Whiteman’s time in the limelight began to fade. Though he made several generally immemorable swing records, and appeared on the first issue of Johnny Mercer’s Capitol Records in 1942, he never returned to the fame he knew in the 1920s. Whiteman continued to lead bands sporadically into his twilight years, and died of a heart attack in 1967. 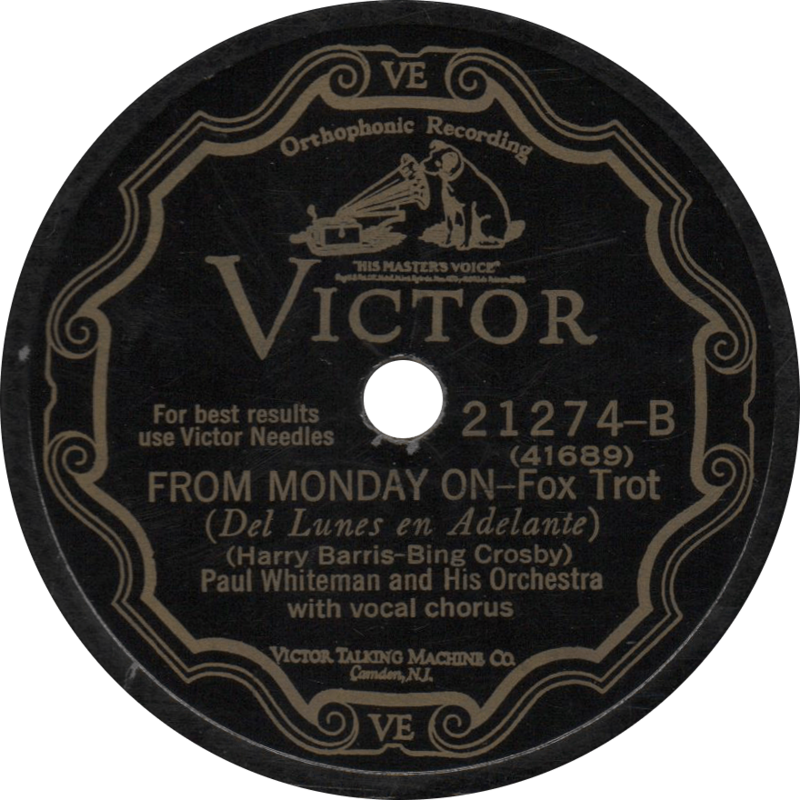 Victor 21274 was recorded in two separate sessions in 1928, the first on February 18, and the second ten days later on February 28. The band, featuring some of the top white jazz talent of the day, included Bix Beiderbecke on cornet, Eddie Pinder on trumpet, Bill Rank on trombone, Frankie Trumbauer on C-melody sax, Chester Hazlett on alto sax. Izzy Friedman on clarinet, Charles Strickfaden on tenor sax, Roy Bargy on piano, Min Leibrook on tuba, Mike Pingatore on banjo, Mike Trafficante on string bass, and Hal McDonald on drums. One of the great classics introduced by Whiteman’s orchestra, and a mainstay of his repertoire was Harry Barris’ “Mississippi Mud”. 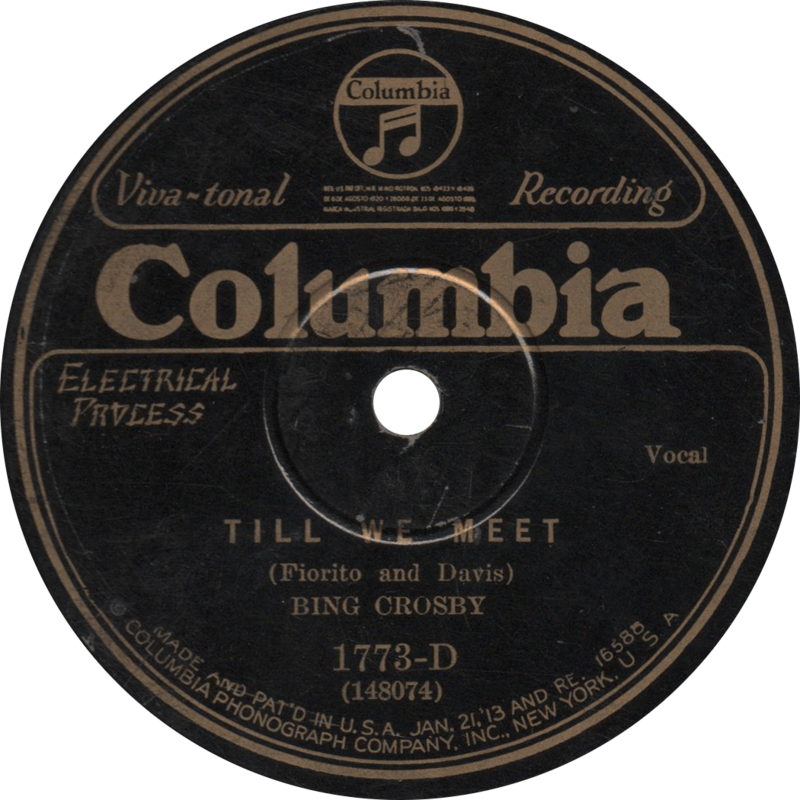 The outstanding vocals on this side are provided by Miss Irene Taylor, assisted by the Rhythm Boys: Bing Crosby, Harry Barris, and Al Rinker, and a second vocal trio consisting of Jack Fulton, Charles Gaylord, and Austin Young. This is take “3” of this side, take “2” was later issued on Victor 25366. 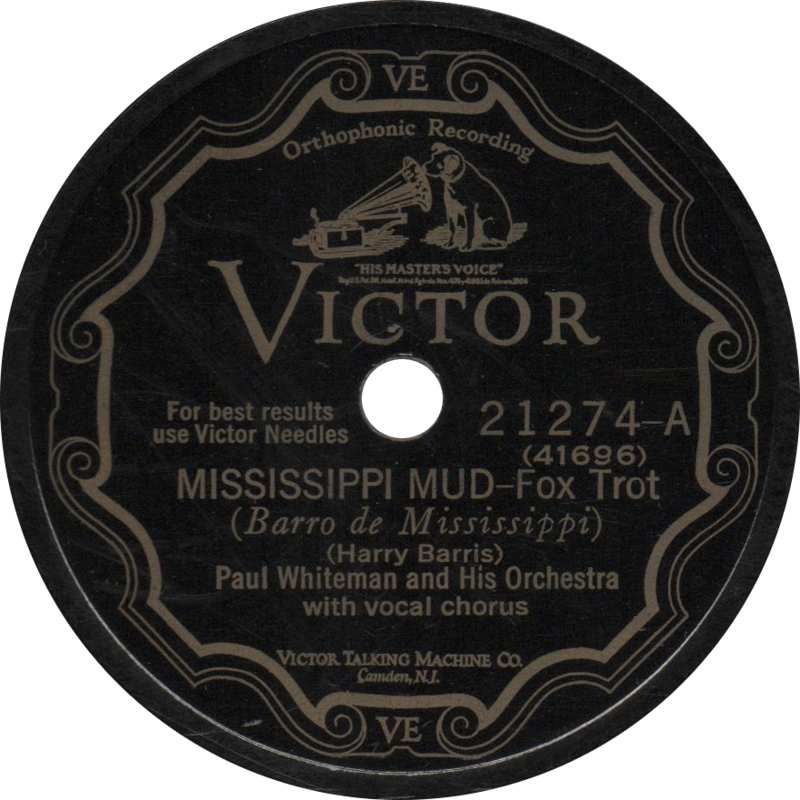 Mississippi Mud, recorded February 18, 1928 by Paul Whiteman and his Orchestra. 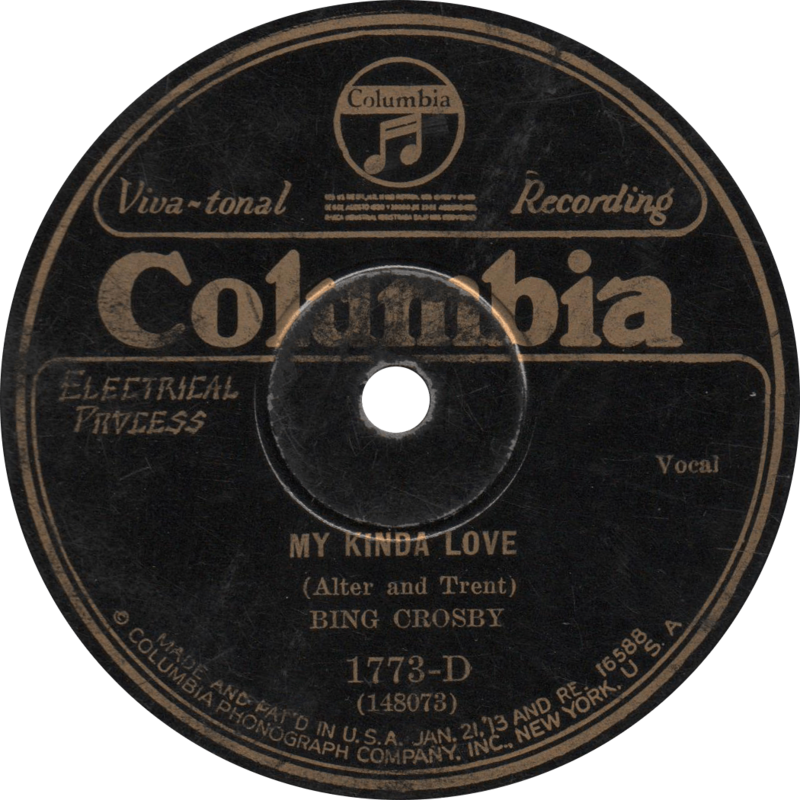 On “From Monday On”, another Harry Barris composition, Bing takes the lead vocal, backed up by the same group featured on the first side. This side is take “6”, take “4” was later issued on Victor 25368 and take “3” appeared on Victor 27688. From Monday On, recorded February 28, 1928 by Paul Whiteman and his Orchestra. Really fine tunes, both of them. Updated on May 31, 2018. Since I regrettably don’t own a copy of “Auld Lang Syne” by Guy Lombardo’s Royal Canadians with which to usher in the New Year the traditional way, we’ll have to ring in the new year here at Old Time Blues with a different sweet band. 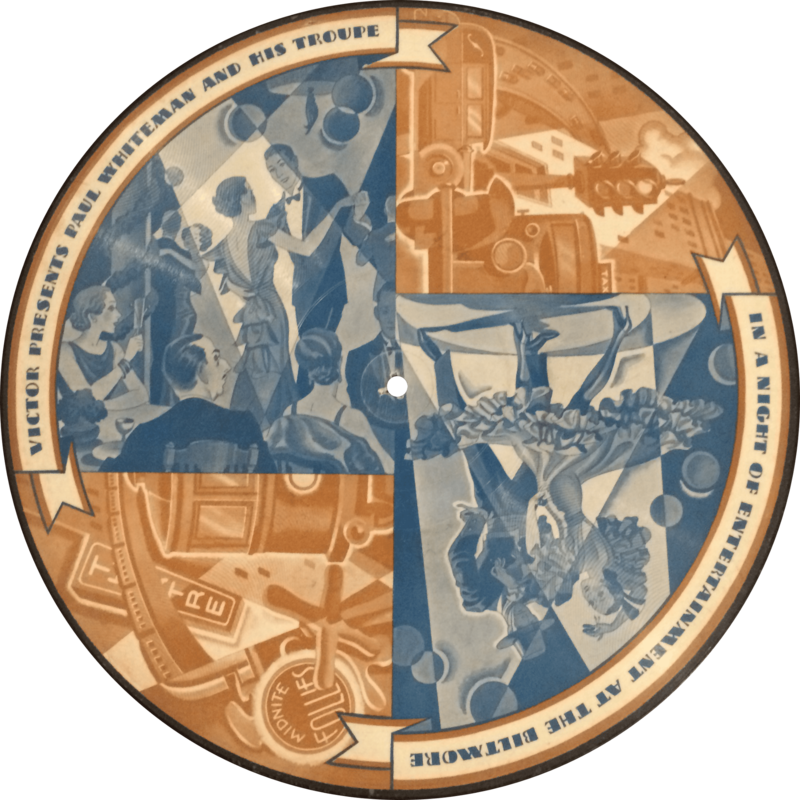 As we prepare to get 2016 started out right, for our last post of 2015, here’s Paul Whiteman’s orchestra on one of his gorgeous Art Deco styled early 1930s picture records, with a medley of some of his most popular songs, played and sung by some of his most popular talent. As a side note, I do believe I’ll be tuning into Radio Dismuke for their annual New Year’s Eve Show this evening, and if you like the music I post here, I’d wager that’d tickle your fancy, too. Nat Natoli and Harry Goldfield on trumpets, Andy Secrest on cornet, Jack Fulton on trombone, Hal Matthews and Bill Rank on trombones, Chester Hazlett on clarinet and bass clarinet, Charles Strickfaden on alto and baritone sax, Frankie Trumbauer on C-melody, alto sax and bassoon, John Cordaro on clarinet and tenor sax, Kurt Dieterle, Mischa Russell, Matty Malneck, and John Bowman on violins, Roy Bargy and Ramona on pianos, Mike Pingatore on banjo and guitar, Art Miller on string bass, and Herb Quigley on drums. On the first part of this twelve inch musical extravaganza, the Whiteman group plays “Whispering”, “The Japanese Sandman”, “Some of These Days” featuring Roy Bargy and Ramona Davies, “Ida (Sweet as Apple Cider)” sung by Red McKenzie, “Dinah” by Peggy Healy, and “When Day is Done” featuring the trumpet of Harry “Goldie” Goldfield. A Night With Paul Whiteman at the Biltmore [Part 1], recorded December 2, 1932 by Paul Whiteman and his Troupe. Part two of the medley includes “St. Louis Blues” sung by Irene Taylor, “Sweet Sue” by Jack Fulton, “Mississippi Mud” sung by the Rhythm Boys (Al Dary, Jimmy Noel, George MacDonald, and Ray Kulz; not Bing, Al, and Harry), “I Can’t Give You Anything but Love” by Jane Vance and Al Dary, a rousing “Wabash Blues” with Mike Pingatore (or is it Pingitore?) on banjo, and “Three O’Clock in the Morning”. A Night With Paul Whiteman at the Biltmore [Part 2], recorded December 2, 1932 by Paul Whiteman and his Troupe. Updated on June 1, 2017, and with improved audio on July 3, 2018. My wife can eat, boy, she’s eatin’ all the time. Can eat ham and eggs and the table legs and I just can’t save a dime!